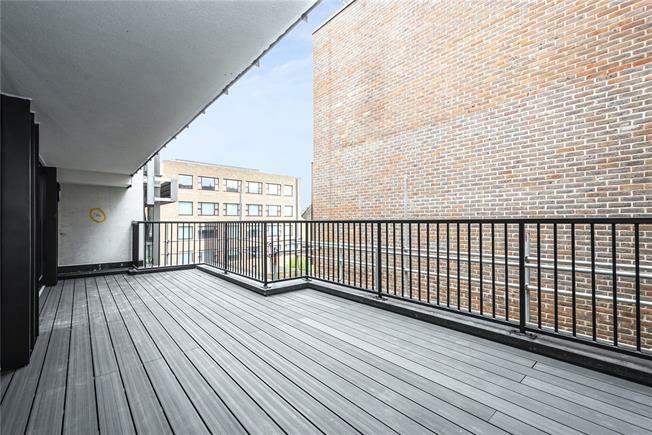 A superb development of contemporary and high end apartments in the heart of De Beauvoir Town. The upper floor units have views of the canal and all spaces from 1st to 5th floor are lateral and designed to offer a living space ideal for entertaining. The kitchens are Italian imported and appliances “De Dietrich”. The bathrooms have luxury showers with glass sliding shower screens and porcelain tiled bathrooms. Wooden floor is offered throughout and the sliding glass doors and windows are tripled glazed. The use of solar power further optimises energy use, reflected in the favorable EPC, and the communal heating aspect mean bills to residents are minimal. The penthouses are accessed via a private lift directly into the apartments. The development is all electric and have linked fire and safety alarms. Apartments range from 960 to 1,475 sq ft and the tenure is virtual freehold with a 999 year lease. The commercial elements of the development are B1 use and so strictly for office space. Quarter Century House is situated between the superb amenities of vibrant Upper Street, Essex Road, Dalston, Broadway Market, Hoxton and Shoreditch. The nearest travel links are Haggerston Overground Station, which offers easy access to the City, Canary Wharf, Highbury & Islington and Whitechapel, where Cross Rail is due for completion shortly. There are also many bus routes on Kingsland and Balls Pond Road providing access around London.